Site du projet humanitaire "Beach Hearts Over the World" qui a pour but d'aider un orphelinat à Marrakech qui manque de moyens. Pour cela des beachers pros du circuit mondial se sont mobilisés. Site of the humanitarian project " Beach Hearts Over the World " who aims at helping an orphanage in Marrakesh which misses means. 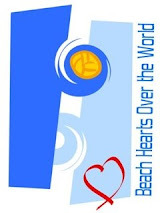 For it pros beach volley players of the world tour are mobilized. Thanks to Jose Salema from the Argentinian team (with Mariano Baracetti) who gave to "Beach Hearts Over the World" his jerzey from the World Beach Volleyball Championships in Stavanger.